were generated. CID-spectra together with the characteristic fragmentation scheme of PEG molecules are presented in Fig. 2.9.5 . Fig. 2.9.5. APCI-FIA-MS-MS(+) (CID) product ion mass spectrum of selected [M + NH4]+ parent ion (m/z 476) of non-ionic surfactant metabolite identified as PEG homologue (general formula: HO-(CH2-CH2-O)x-H); fragmentation behaviour under CID presented in the inset . carboxylated PEG with the general formula HO-(CH2-CH2-O)x-CH2-COOH observed as Am/z + 14 [M + NHJ+ ions at m/z 314, 358, 402,...,622 (x = 5-12) applying APCI-FIA-MS(+). Identity was confirmed by MS-MS .
ESI-LC-MS was used to analyse a mixture of 2-butyl branched C12-AE containing an average of five PEG units after submitting the mixture to biodegradation. SPE applying Carbograph 4 cartridges was used for the extraction of the compounds in samples from biodegradation. Neutral and acidic analytes or metabolites could also be concentrated. Selective elution was performed applying neutral organic solvents and acidified organics. After solvent removal, ESI-LC-MS and ESI-LC-MS-MS spectra in the in-source CID mode were recorded. After addition of a decyl-based ethoxylate internal standard, neutral and acidic metabolites were confirmed by mass and MS-MS spectra and mass chromatograms. AE were shortened in ethoxylate chain lengths and/or oxidised resulting in carbonylic or carboxylic compounds during the biodegradation process while, in parallel, highly polar intermediates could be confirmed. Several alternative biodegradation pathways were observed . Surface water samples often contain surfactants and their metabolites. After C18-SPE combined with selective elution [7,9,10] the metabolites, PEG and PPG, were observed in the ether fraction (PPG) or in the combined methanol-water and methanol (PEG) fractions, respectively. They could be ionised in the form of their [M + NH4]+ ions applying ESI -FIA-MS(+ ) in combination with ammonium acetate for ionisation support. ESI-LC-MS(+) resulted in an excellent separation of both metabolites, as presented in the total ion current (TIC) trace in Fig. 2.9.6(7) together with selected mass traces of PEG (m/z 300, 344 and 388) and PPG (m/z 442, 500, 558) (Am/z 44 and 58) in Fig. 2.9.6(1)-(6) . Mono- and di-carboxylate polyethylene glycol (MCPEG and DCPEG) and PEG besides APEO and nonylphenol ethoxylates (NPEO) were found in wastewaters that were discharged to surface waters without any treatment. These compounds were identified after SPE and liquid chromatographic separation followed by ion-spray mass spectrometric determination (ESI-LC-MS) in the 'in-source-CID' mode. With an elevated cone voltage of 80 V, examination was performed resulting in fragment ions that permitted the confirmation of MCPEGs, DCPEGs and PEGs . A synthetically produced mixture of DCPEG homologues used for calibration purposes in the analysis of negatively ionised compounds by FIA and LC-MS was examined by APCI and ESI in the FIA and LC-MS(+/") mode. All FIA-MS spectra were highly complex because of the mixture ionised and in addition the ESI-FIA-MS spectrum contained double-charged ions—recognisable by ions equally spaced with Dm/z 22 besides the single-charged ions that were also equally spaced, however, with Dm/z 44 as shown in Fig. 2.9.7(a). As observed with the poor separation by LC homologues and isomeric compounds as products of an untargeted synthesis could not be separated from each other, which did not facilitate MS -MS examinations and identification of compounds. For recognition of complexity, mass traces of homologues with Dm/z 14 spaced were presented in Fig. 2.9.7. For identification purposes, selection of parent ions before CID in the LC-MS-MS(+) mode was performed. Identification by CID provided the information that the mixture produced from precursor PEG compounds by an unselective oxidation process consisted of five dominating series of homologues of compounds different in their structural formulae . 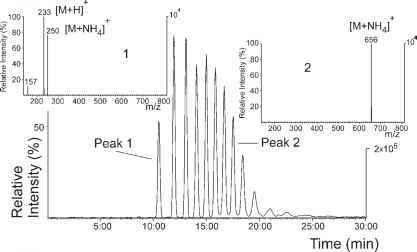 First, attempts to identify by interpretation of the product ion spectra of the [M + NH4]+ precursor ions at m/z 592, 606 and 620 were made. The product ion spectra of the selected parent ions are presented in Fig. 2.9.8(a)-(c) together with a general fragmentation scheme amenable to DCPEG . Fig. 2.9.7. 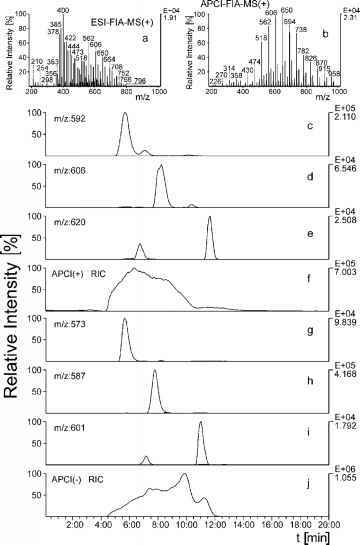 (a) ESI-FIA-MS(+ ) and (b) APCI-FIA-MS(+ ) overview spectra of synthetically produced mixture of di-carboxylated PEG homologues; (f) APCI-LC-MS(+ ) and (j) APCI-LC-MS(- ) RICs of mixture as in (a,b); (c-e) selected mass traces of di-carboxylated PEG homologues under positive and (g-i) negative ionisation. Gradient elution separated by RP-C18 column . Fig. 2.9.8. 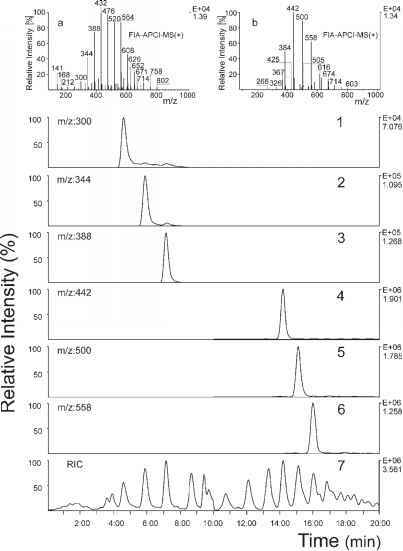 (a)-(c) APCI-FIA-MS-MS(+) (CID) product ion mass spectra of selected [M + NH4]+parent ions (m/z 592,606 and 620) of synthetically produced carboxylated PEG homologues; generalised fragmentation behaviour under CID presented in the inset . Fig. 2.9.9. General structural formula of alkyl polypropylene glycol ethers. FIA-ESI(+) was not successful . 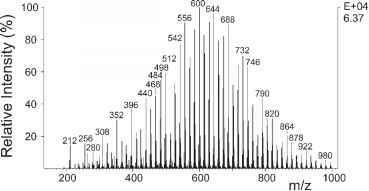 Besides [M + NH4]+ ions (•) with equidistant signals (Dm/z 58) at m/z 250-946 and [M + H]+ ions (★) at 233-581, [M + NH4]+ ions of PPG (O) at 384-964 (Dm/z) 58 can also be observed by APCI-FIA-MS(+) (cf. Fig. 2.9.10(a)). Moreover, fragment ions of PPG accentuated by # in Fig. 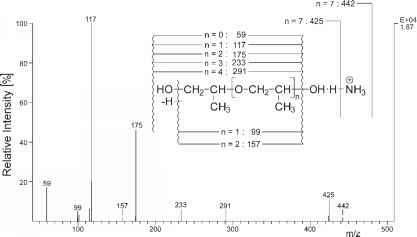 2.9.10(a) appeared as dominant ions at 117 and 175 using a standard ion source temperature of 400°C. Reduction in temperature down to 200°C resulted in an overview spectrum more similar to TSI-ioni-sation , which now consisted only of [M + NH4] + (•) and [M + H]+ ions (*) of the non-ionic AP surfactant homologues (cf. Fig. 2.9.10(b)). Separation of the C7-AP blend, as presented with its APCI -FIA-MS(+ ) overview spectrum in Fig. 2.9.11 was also performed. Signals of the surfactant homologues differing by Dm/z 58 could be recognised under optimised ionisation conditions in the overview spectrum. APCI-LC-MS(+) then recorded on a RP-C18 LC column  resulted in an excellent separation shown in Fig. 2.9.12. 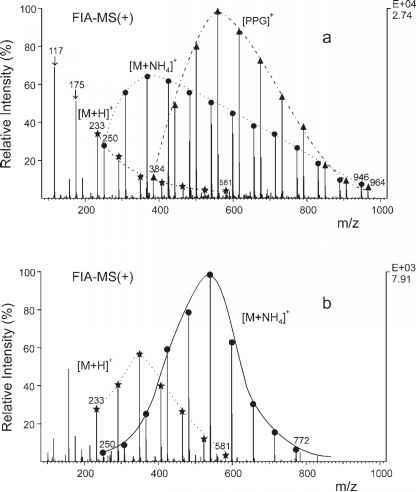 Mass spectra of selected peaks at m/z 250 and 656 in insets 1 and 2, respectively, prove the excellent separation efficiency of this method, showing either the [M + NH4]+ionofthe non-ionic surfactant C7H15-O(CH(CH3)CH2O)mH with m = 2 at m/z 250 and its [M + H] + ion at m/z 233 or the homologue with m = 9 with m/z 656 .
fragmentation behaviour of the C7Hi5-O-(CH(CHs)-CH2-O)8-H homologue is presented in Fig. 2.9.13 . Fig. 2.9.11. APCI-FIA-MS(+) overview spectrum of AP blend (CnH2n+1 -O(CH(CH3)-CH2O)m-H) containing Dm/z 58 spaced ions . Fig. 2.9.12. (bottom): APCI-LC-MS(+) RIC with insets of averaged mass spectra of selected signals. (top): Separation efficiency obtained by averaged signals is presented in insets 1 and 2 . Fig. 2.9.13. 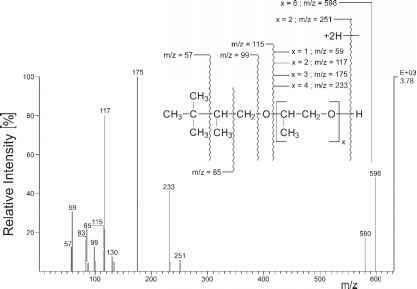 APCI- FIA- MS - MS(+ ) (CID) product ion mass spectrum of unknown parent ion with m/z 598, identified as non-ionic surfactant of AP type (CnH2n+1-O-(CH(CH3)-CH2-O)m-H); (inset) fragmentation scheme under CID conditions . with the degradation of AP surfactants. So PPG will be generated in the biochemical wastewater treatment process by bond scission between the lipophilic alkyl chain and the hydrophilic ethoxylate moiety. The resulting ethoxylate compounds, PPG, are less polar than PEG but more stabile in the biochemical degradation process. In water samples of the Saale river (Germany) and Thessaloniki (Greece) wastewater treatment plant (WWTP), PEG and PPG as metabolites of ethoxylate-surfactants could be confirmed successfully by APCI-FIA-MS-MS(+). The APCI-FIA product ion spectrum of selected [M + NH4]+ ions of PPG (general formula: HO-(CH2-CH(CH3)-O)xH) together with its characteristic fragmentation scheme is presented in Fig. 2.9.14 [22,34]. A PPG biodegradation product as metabolite of PPG generated by metabolisation of AP could be observed and verified by MS-MS(+) when WWTP effluents were examined by APCI-FIA-MS(+) and selected compounds were identified by FIA-MS-MS(+). In the SPE effluent extracts, two ions at m/z 266 and 324 were observed, which could be confirmed as homologues because of their identical fragmentation pattern . Compounds could be characterised as secondary metabolites of the biochemical degradation product 'PPG'. Applying the diagnostic parent ion scan m/z 115  to the mixture containing these compounds, ions at m/z 266 and 324 can be observed . By analogy with alkyl polyethylene glycol ethers , PPG had been degraded resulting in short chain aldehyde homologues with the general formula HO-(CH(CH3)-CH2-O)X-CH(CH3)-CHO (x = 3 or 4). These metabolites could be ionised as [M + NH4]+ ions at m/z 266 or 324 when APCI-FIA-MS(+) was applied. CID of the ion at m/z 266 led to fragments that are presented as product ions and fragmentation behaviour in Fig. 2.9.15 . Fig. 2.9.14. 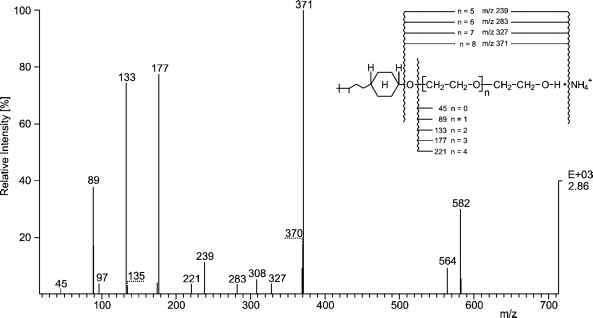 APCI-FIA-MS-MS(+) (CID) product ion mass spectrum of selected [M + NH4]+ parent ion (m/z 442) of non-ionic surfactant metabolite observed in Cig-SPE eluates; PPG homologue (general formula: HO-(CH2-CH(CH3)-O)x-H); fragmentation behaviour under CID presented in the inset . Fig. 2.9.15. 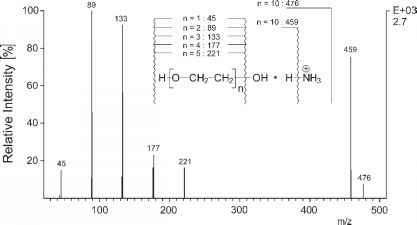 APCI-FIA-MS-MSMS-MS(+) (CID) product ion mass spectrum of selected [M + NH4]+ parent ion (m/z 266); compound was identified as metabolite (aldehyde compound) of degradation product of non-ionic surfactant compound PPG (general formula: HO-(CH(CH3)-CH2-O)x-CH(CH3)-CHO (x = 3); fragmentation behaviour under CID presented in the inset . structural formula in Fig. 2.9.16, will be generated . 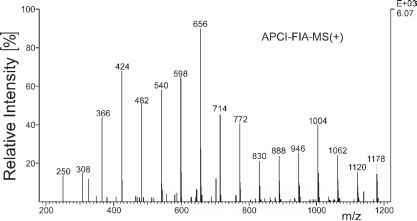 Because of the varying number of m and n and the variation in the number of carbon atoms in the alkyl chains, the number of isomers and homologues generated gives rise to the APCI-FIA-MS(+) spectrum which is presented in Fig. 2.9.17 . Obviously the identification of these EO/PO-block polymers can be considered as very difficult. Even the detection of these surfactants is quite complicated because they cannot be monitored by optical systems because of a missing chromophore in the molecules. These compounds are hardly degradable in biochemical degradation processes and therefore accumulation cannot be excluded. Their acute toxicity against water organisms was found to be low . Fig. 2.9.17. 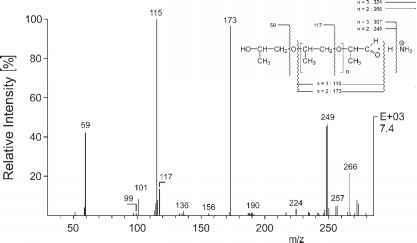 APCI - FIA- MS(+) overview spectrum of fatty acid EO/PO polyglycolether blend ionised as [M + NH4]+ ions . compounds with the identical molar mass cannot be differentiated. Here, only the separation on analytical columns combined with MS detection (LC -MS) may help to differentiate between isomers with a variation in the number of alkyl chain links and/or different EO/PO compositions as presented in Table 2.9.1.